Last fall Industrial Hoist, LLC was subcontracted by the Ciri Group to take on a joint project in a facility on Ft. Richardson Army Base. 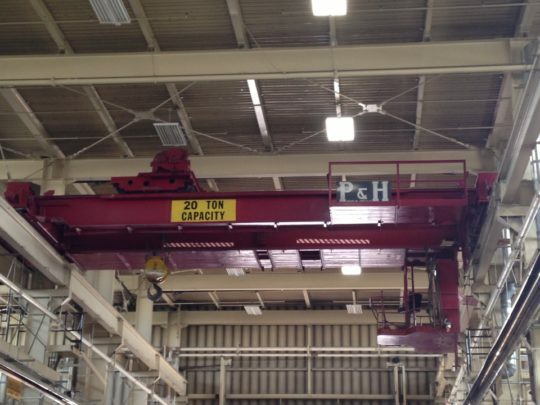 This project consisted of three major phase of updating the operation controls, electrification and bridge travel brake system, on three early 1940’s vintage P&H overhead cranes. To ensure the highest level of efficiency, we have a fully dressed service trailer that we utilize during the duration of our off site projects. We removed the old main power electrification system and updated it with modernized Figure-8 Duct-O-Bar. A two-man crew worked diligently from man lifts 30’ in the air to remove approx. 3000’ of copper bar, built new hangers and installed a new 4-bar conducting system. We worked closely with Laird Controls in designing and engineering a radio remote and brake system for the two, 10 Ton cranes that would pair flawlessly with the cranes current motors, and contactor controls. 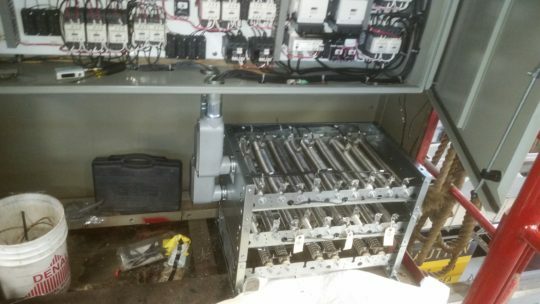 Prior to taking the radio remote control enclosure and brake control enclosures to the site, we pre-fabricated our mounting system for the enclosures, also pre-wired the components to aid in a faster more efficient installation. On these two cranes, we designed a system that in the event of a remote failure the system is still operable for the cab controls by simply flipping a switch. The brake system although a simple concept was a pretty complex unit, combining electric, hydraulic and manual controls all to work together to make the bridge come to a controllable stop during operation. The 20 Ton crane although built by the same manufacture, P&H, it in itself was a completely different animal than the little sisters to the north and south of it. The original controls system and motors were completely different. Because of this a nd the added complexity of the system, we, along with Laird Controls, brought in Copley Controls, a third control and engineering group. 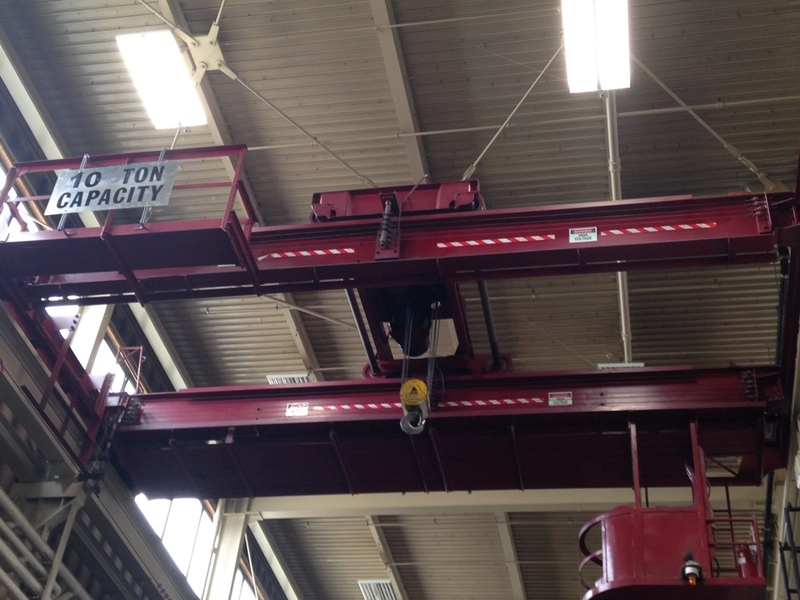 Once we received the new control enclosure and remotes system for this crane, the fun began. Unlike the two little sisters to this crane, we were not able to utilize any of the old control systems. The motors were left original but everything else we removed and replaced with new controls, and resistor bank. On this unit, we utilized the old control box location and cab to house all of the new systems. All these cranes are now equipped with hand held remote controllers for operation. 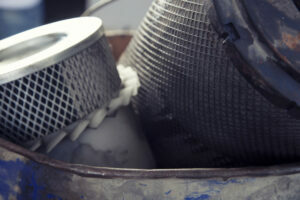 This enables the operators to work more safely and efficiently from the ground.